The Bicycle Advisory Committee,(BAC), is comprised of a group of area cyclists representing commuters and recreational users. The BAC, following the guidlines set forth in the BAC Resolution, advises the District about new road designs, roadway maintenance needs specific to cyclists, and other cycling-related issues. All committee meetings are open to the public. According to the BAC bylaws , this advisory committee will be comprised of volunteers who are active bicycling advocates. 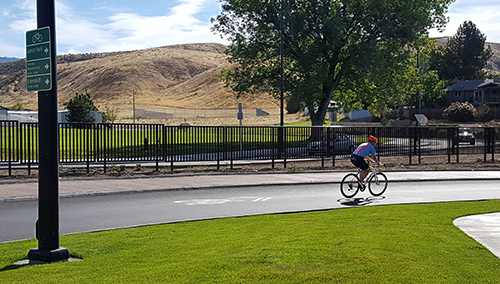 They must be residents of Ada County, and represent a broad cross section of cyclists, including individual riders and members of the cycling community. Brian McClure is a planner for the City of Meridian, and is an ex officio member of the Committee. Ryan Head -- Supervisor Planning & Programs. Josh Saak -- is a bicycle commuter, avid cyclist and Traffic Design Engineer. The Bicycle Advisory Committee generally meets the first Monday of every month. Meetings start at 6:00 p.m.